Narita looks a lot like Vancouver except with more bamboo and bowing. It is 8 degrees and I feel　like it is minus 30. I am also pretty out of it with the time difference after flying out ofHanoi at midnight and arriving here at 7 AM local time and the flight was only 4 hours. It just doesn`t make sense given thatI am travelling east. Anyway all is well and I will be in Vancouver two hours from now--- if there were no such thing as time zones---but in reality it is something like 16 hours away. Lu's boyfriend Eduardo is a really brilliant photographer. Check out his blog for more photos of the Thaipusam festival we attended last week. Well it seems that I won't be able to provide you the kind of complete and detailed account of my trip to Vietnam and Cambodia I had promised and I am sorry for that faithful reader. I hit a critical point in the last week and have decided to go home a couple of weeks early. But this is not a sad thing; it feels quite right. Since I have only a short time left in Asia and it will be a scramble to finish the reports I have been working on, please forgive what will be a brief run through of the last 10 days of our trip. So we left off in Chau Doc a town seemingly unused to its role as jumping off point for backpackers heading up the river ways to Phnom Penh. We were picked up around 7AM to catch the boat and we met two other couples who seemed interesting. One was from Chile very focused on photography and the other was a British couple cycling their way across Asia. They had started off in China and then rode down the whole of Vietnam and were going through Cambodia and Thailand. I felt very inspired by them, although they did have to deal with a lot more hassle trying to get their bikes on and off the boats and vans that made up this journey. Although we had been promised that we had skipped the tours that were included in this trip it seems we only made it out of the visit to a fish farm but we were brought to a "traditional Cham (a Muslim minority) village". I really hate stuff like that. It feels like a human zoo you really don't learn anything about the people anyway. So Jono and I hung out on the boat and waited. The British couple returned with long faces and said that we didn't miss anything. So then finally the trip was really underway. I felt like I was in some twisted version of the Life of Pi trapped on a small wooden boat with a group of very distinctive characters who might turn on each other at any moment. There was a this really obnoxiously talkative and boastful British guy and his younger American disciple. A family from Denmark with very tattooed parents who busted out some hard liquour when the trip sank into hot afternoon doldrums. A couple of a Thai wife and a Czech husband with their small daughter and a slew of older German men, a Australian Vietnamese family the son of which surprised me when after finding out we were Canadian asked if I didn't think it would be better if Quebec separated and became part of the US, some other random backpackers and one soft looking Japanese guy who didn't talk to anyone. Anyway this trip was the definition of epic we left at 7 and arrived in Phnom Penh after 9PM. The whole trip was spent sitting on wooden benches and there was no toilet of any kind. I was amazed that the kids were able to survive this. That being said we saw things going up the Mekong that you would never see travelling any other way. Every little kid living on the riverbanks shouted hello to us from their wooden stilt houses or as they were tending to their water buffalo or cows. We saw how people live who are so totally off the grid it could be another time altogether. It looked like a peaceful but difficult life trying to get what you can out of the ancient Mekong soil. When we finally arrived in the city everyone in the group was at their wits end and people were shouting at the tour guide and demanding to be dropped off places that the driver didn't want to so it was with that residue on our skin that we agreed to rent an icky and expensive room above an "Irish" pub just to have an some respite. We ended up staying in Phnom Penh for another night, which was against our plan, because we didn't get it together early enough to catch the bus to Siem Reap. At the time I was disappointed in our lack of organisation on that but now it seems clear that we were totally exhausted and it was better not to try to push it anyway. Phnom Penh feels like a place of extremes, like I wrote in my post from my first visit there, this struck me again this time. It is easy to make comparisons with Vietnam because they are neighbours and have some common history but the mass implosion that took place in Cambodia still can be felt, and like it had a bigger impact maybe because the evil was known to be within the countries leadership instead of a foreign force that could be ousted. While we were in Phnom Penh we visited the museum at Tuol Sleng which was a gut wrenching and perplexing place. How could so many people have been so brutally treated and killed at what still looks like the high school it once was? On January 13 we headed up to Siem Reap to finally see the temples at Angkor. There is a bit of a system in place in this town where the tuk-tuk driver's really take the lead in your experience. We were given a ride from the bus station for free and the driver helped us find a nice hotel. He told us he would pick us up at 4:30 so that we could go get our pass to the park and see the sunset at one of the temples. It was clear as soon as we arrived that all of the drivers did this same time as the hilltop temple was so crowded it was hard to even see the structure itself. Still it felt pretty cool to be there amoungst such a great ancient achievement of artistic vision. The next day we allowed ourselves to be trotted around to all the most famous sites but as interesting and important as they are we were on this route that all of the other people were on going to the same places in the same order at the same time and I found that annoying. I am really not trying to be pretentious but I just don't make a good tourist. Jono got a couple of really good shots of some of the tourists though, including one of this old Japanese guy with an umbrella hat (you know those ones that makes it look like an umbrella is growing out of your head like a mushroom) and a huge camera. I have to get him to post some of those shots; I think they are some of my favourites from the trip! 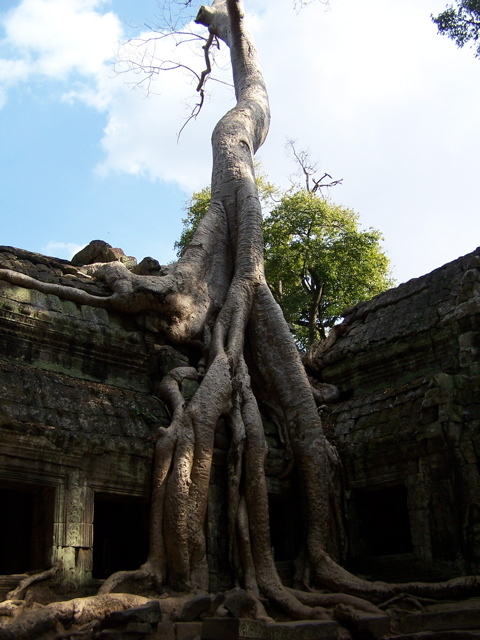 You know that very famous temple with the roots growing into it? I found that spot swarmed with Japanese girls getting pictures taken as they made peace signs and cute poses with the root. It was too hilarious, except if you wanted to get a photo without anyone clambering all over your shot. Angkor Wat itself was intriguing not to mention fun to climb and I really loved seeing the faces at Bayon but I had the most fun when we returned on bicycles the next day and totally did our own thing trekking through the less busy sites and following jungle paths pretending we were early explorers. When dusk was settling in we were off finding the wall to the city of Angkor Thom and when we reached it and climbed up, all that was on the other side was dense jungle and monkey calls and I really could picture what the place was like 100 years ago. The next day we bussed it back to Ho Chi Minh City and although it took all day it was quite a painless trip. To anyone planning to take the bus in area I really recommend the Mekong Express company; it was certainly better than any other I have taken in Asia. We only had two days left in HCMC and we did some souvenir shopping, went for a cyclo ride to the Chinese area of ChoLon, ate lots of pho and nuoc soda chanh (lemon soda) went for beers on Pham Ngu Lao and then it was a very teary and fuzzy-headed goodbye on the 19th when Jono left on the long trip back to winter. And that brings us back to my journey back to KL, which is where this yarn started.